There is a brand new blues label in Chicago, called Swississippi Records. Their first three releases come out on September 21, and they are Rob Blaine's Big Otis Blues, Peaches Staten's Live at Legends, and Chris Harper's Four Aces and a Harp. The first two are different takes on what has become of blues music these days. The Blaine album is a blues and rock hybrid, while the Staten album presents a powerful soul shouter who reminds us that the B in R&B stands for blues. But I am a traditionalist when it comes to blues. I love the acoustic blues that predated World War II, and those who keep that sound alive. I also love the parallel development of jump blues, which is where jazz gets its blues flavors from. Finally, pure blues, for me, reached its peak with the Chicago sound of the 1950s. 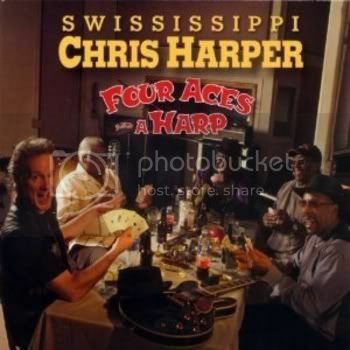 So the prize in this first batch of Swississippi releases is Four Aces and a Harp by Chris Harper. This is actually a very unusual project. Usually, a blues album in a single artist’s name is a showcase for their playing and singing. True, Harper plays harmonica on all tracks here, but he sometimes plays a supporting role, depending on what the song needs. And Harper sings on only five of the album’s 18 tracks. Two other singers take five songs each, and still two more take one each. (If you’re counting, that’s 17; there is one instrumental.) So I wouldn’t call Harper the leader here. Rather, he and co-producer Dave Katzman are the hosts. You see, Harper and Katzman set out to gather together as many Chicago bluesmen as they could find, and record an album that presented the traditional sounds of Chicago blues, as well as earlier blues styles that influenced the Chicago sound. So there are 17 musicians on this album, playing in various configurations. For the electric numbers, there are drums, bass, guitar, and of course harmonica. Sometimes they are joined by slide guitar or piano. A couple of songs also have washboard. The acoustic numbers have drums, stand-up bass, acoustic guitar, and harmonica. I’ve never heard an acoustic ensemble like that playing blues, but it sounds great. The danger in a project like this is that it could come out sounding like a museum piece, with classic tunes slavishly recreated in their best known arrangements. But Harper and company are presenting this music as a living tradition. The arrangements on Four Aces and a Harp are new, but belong within the tradition of Chicago blues. “Arrangements” may not even be the right term; this album has the feel of a group of very talented friends getting together and jamming on the music they love best. Also, the song selection helps make this one sound fresh. There are songs here that were originally done by Howlin’ Wolf, Muddy Waters, Sonny Boy Williamson, and so forth. But these are not their best known songs, which gives Harper and Co more leeway to make the songs their own. Two songs, Blues is My Life and You Make Me Fly, are Harper originals. From these, it is clear that he brings a strong jazz flavor to the proceedings. Blues is My Life, in particular, is a song I would love to hear with a horn section. The instrumental song on the album is Don’t Get Around Much Anymore, probably also a Harper selection. And these all swing. Just a few of the highlights among the electric numbers are Evil is Going On, Long Distance Call, and What’s Wrong. But the acoustic numbers are the ones that really knocked me out. I Smell Trouble is a ballad, and a song I knew I would post the first time I heard it. The song is a cry, and it is completely convincing. Born in Arkansas is a more uptempo number, and it also completely works for me. The album also has fine versions of Down in the Bottom, Next Time You See Me, and Worried Life Blues. One of the pleasures of this album is the sense of comraderie that comes through in the performances. Many of the songs have instrumental lines that intertwine, and there is also great interplay between the singers and the instrumentalists. Sometimes the guitar and piano, or guitar and harmonica, seem to have a conversation. The drums and bass provide a solid rhythmic foundation, but they also add in these little asides here and there. It sounds like the musicians were having a great time, and the resulting music is very exciting. All told, Four Aces and a Harp is seventy-two minutes of music, spread over 18 songs. It doesn’t seem nearly that long. Maybe, there are another 18 songs left over from these sessions. If so, I’m ready to listen to them right now. It would be my pleasure.